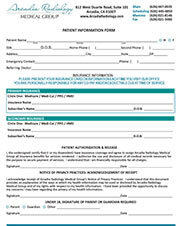 Patients, please download and fill out this form prior to coming in for your appointment. You can bring it with you or fax it to (626) 821-3460. 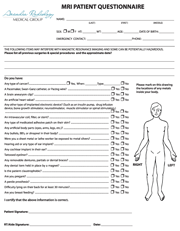 MRI patients, download and complete this form prior to your appointment to save time. Bring it with you or fax it to (626) 821-3460. Patients visiting Arcadia Radiology will need to fill out the HITECH Act required Patient Questionnaire each time they arrive for their appointment. Bring it with you or fax it to (626) 821-3460. 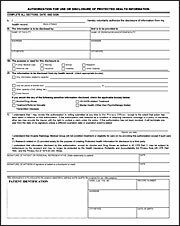 Patients, please use this form when you wish to have your protected health information released to you or another party. 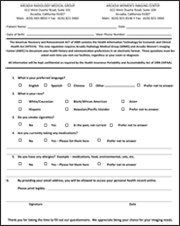 You may bring this form to our office or fax it to (626) 821-3460. At Advanced Magnetic Imaging and Advanced Women’s Imaging, we understand you have choices when it comes to diagnostic imaging services.